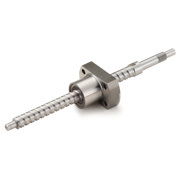 NSK’s MBSA Series combines a precision ground ball screw with an NEMA stepping motor. This innovative design delivers a compact, space-saving design eliminating the need for motor couplings providing maximum precision for laboratory equipment and medical devices. K1™ Lubrication is a patented unit that prvoides long-term maintenance-free operation in environments where grease replenishment is undesirable or easily washed away. Support bearings are factory lubricated with special long-life grease designed to extend ball screw's product life. Compact FA Series are domestically manufactured and available within a 4 week lead time. Size ranges from 10-25 mm with various lead and stroke ranges are included within this quick ship program. FULRIDE™ is a roller type linear motion slide that can be readily modified into a belt-driven actuator.